The same can’t be said for the first installment of “Robbin’ Season” (“Christmas approaches, and everybody gotta eat,” Darius explains). In “Alligator Man,” written by Glover and directed by Hiro Murai, Atlanta condenses and clarifies everything I’ve loved about the series from the start, this time with a self-confident edge, a chip on its shoulder: It’s funny, provocative, offbeat, slyly beautiful, and gently affecting, often all at once. 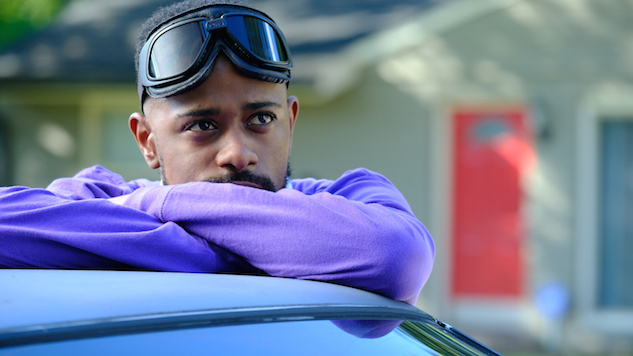 Take the scene in which Darius (Lakeith Stanfield, in one of the most magnetically strange and absurdly funny performances on television), sitting atop the car as he and Earn fuel up, brings up the season’s unorthodox title. There’s the implausible print on his pants, his jet-black goggles, his color-blocked shirt with the white collar—bright, almost childlike splashes that led me to write in my notes, “That outfit is !!!! !” There’s Earn’s half-philosophical question about the flavor of Hot Cheetos, and Alfred’s (Bryan Tyree Henry) deadpan “Take me off speaker.” But there’s also the sound of sirens roaring past in the background, and the Timberlands on a corpse. “Alligator Man,” like Atlanta as a whole, remixes the comedy and the crime drama: It manages to lean into a certain gallows humor, even as it leans away from treating violence as the sole noteworthy feature of the characters’ environment. It’s realistic, at least temperamentally, but never resigned. Even the episode’s first minutes, in which a nondescript afternoon of videogames and fast food becomes a stick-up gone wrong, is surprisingly beautiful, from the hazy, almost smoky light streaming into the man’s apartment to that soaring pan across the city, sirens replacing the woman’s cries. After all, Atlanta is a series in which crimes and punishments are ubiquitous, and in which Earn (out $375 and a urine sample for a useless drug awareness class), Alfred (under house arrest), Alfred’s friend (just out of prison), and Uncle Willy (afraid enough of catching a charge that he lets loose that gator) nonetheless find reasons to argue, rib each other, taste sliders, exchange conspiracy theories, etc. You know, the stuff of life. There’s no effort to ignore the fact that a drive-thru cashier carries an assault weapon, but there’s also no suggestion that the people populating Glover’s Atlanta are uniformly grim or humorless as a result. There’s love—as Earn professes to the baffled Darius and Alfred. There’s kindness—Earn forking over that $100 to keep the peace. There’s laughter and discomfort and inappropriate pets, all in spite of the fact that probationary classes and police visits are far more likely to be visited upon poor, black people than their rich, white counterparts. It’s telling, really, that the most emphatic treatment of crime is the Darius-narrated montage featuring Florida Man, whom he describes (and Atlanta depicts) as a sort of face-eating, flamingo-punching, havoc-wreaking “alt-right Johnny Appleseed.” Fittingly, given Stanfield’s role in the film, “Alligator Man” enables a similar confusion of expectations as Get Out: “Florida Man,” the real-life trope, is a gag at the expense of poor, white trash devised by white elites on the Internet; Florida Man, in Darius’ reckoning, is actually dangerous, the Bigfoot of white villainy. One man’s humor is another man’s horror, which is to say that Atlanta’s rich imagination is rooted in its desire to do its context justice. On the basis of the season premiere, capped by that gator’s delicious slow saunter and Willy’s simultaneous escape, “Robbin’ Season” promises to be the same lived-in, eccentric, superbly crafted comedy Atlanta always been, only this time with added emphasis. Though it’s absent the sheer newness of “B.A.N.,” there’s nothing shy about “Alligator Man”; on every front—character development, narrative vigor, aesthetic assurance, political subtext—it punches harder on the soft spots Season One unknotted. Maybe most importantly, tonight’s episode confirms that Atlanta remains vivacious and prickly and truly hysterical, the sort of series I’m already sad will someday end, even as it’s just getting going. Then again, I don’t believe in the concept of time, so I guess I’m off the hook.